carriewriterblog: Is Facebook the New Long-Form Platform for Writers? 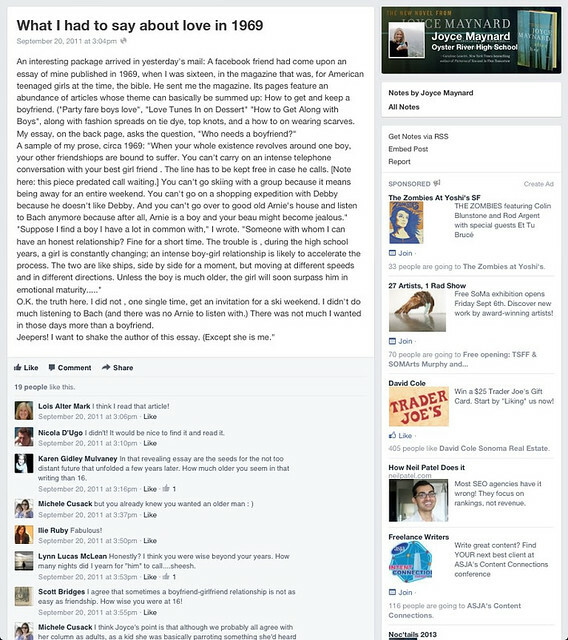 Is Facebook the New Long-Form Platform for Writers? Elizabeth Gilbert attracts her Facebook community with a variety of comic, poignant, and reflective posts that provide transparency and authenticity to her brand. Among several interesting social media trends I noticed this summer was the apparent evolution of long-form posts on Facebook, particularly by writers and authors. While many "regular folks" and small businesses seem to have taken on this style of posting, two of my favorite authors stand out. Joyce Maynard and Elizabeth Gilbert are innovative in making Facebook more relevant and interesting to audiences, with longish posts (at leat 10-12 paragraphs) that succeed in reeling in the reader--at least this reader, along with many others given the response I'm seeing. Maynard posted with frequency and rich detail, about everything from her new novel, (the recently published "After Her,") to her new film based on her book, "Labor Day," to her wedding, to the way in which she feels connected to people, places, and things, hitting a nerve, I think, with many readers who long for such connections. 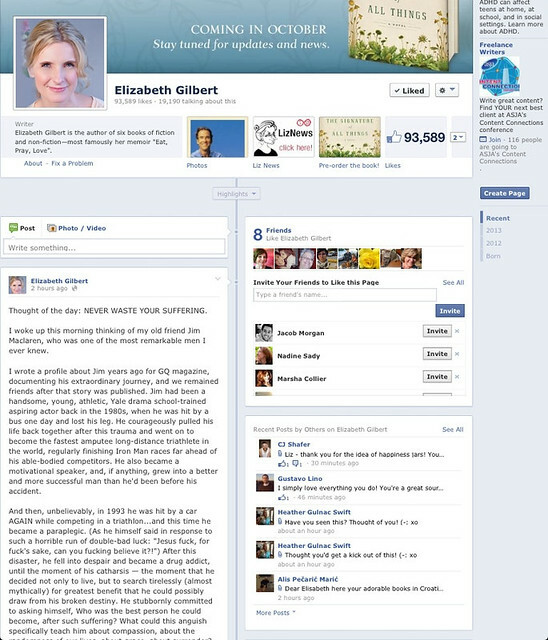 Elizabeth Gilbert also does an amazing juggling act in her Facebook posts, combining book promotion (her newest novel, "The Signature of All Things" comes out this fall), contrasting fun observations of the people next to her on planes, to often poignant vignettes and personal accounts of those "in between moments" in life. Today's post, themed "never waste your suffering," in which she remembers a friend, Jim Maclaren, twice hit by a car, who struggled with drugs and many life challenges, saw over 600 Likes and 250 comments. Author Joyce Maynard is a master of storytelling, sharing dramatic aspects of her literary and personal life with her Facebook community, and not afraid to take quite a few paragraphs to do so. Granted, successful authors know how to write, but this doesn't necessarily guarantee an audience, not to mention Likes, Comments, and Shares. These writers remind us that true social media is about getting that delicate balance right between self-promotion, "edutainment," and sharing. I'm also impressed with the way both these authors use photos to embellish their posts, sharing links from fans, screenshots of cover art, and unusual event photos that aren't your typical run of the mill head shots and handshakes. Gilbert in particular appears to enjoy crowdsourcing her book covers and providing a somewhat flashy "international" flair, proudly showing us "the British cover" here and "the Australian cover" there in her videos. I haven't checked yet and don't know if these authors have their own blogs as well, but if they do, they are keeping them distinct and separate from Facebook. I do know if a writer captures my interest on Facebook, there's a good chance I'll buy the book--or in this case--see their films as well. How about you? Who are your favorite Facebook long-form bloggers and writers? How do they capture your attention?